I bought another new (used) lens for my camera, this time one for macro photography. It's the Nikon AF Micro Nikkor 105mm 2.8 D.
This being late fall, there's not really any flowers or insects to photograph outside, so I've been experimenting with the camera indoors. Again, Hiro was the test subject. He will generally sit fairly still while I put a camera lens very close to his face. Took me a few tries to get his iris in focus... 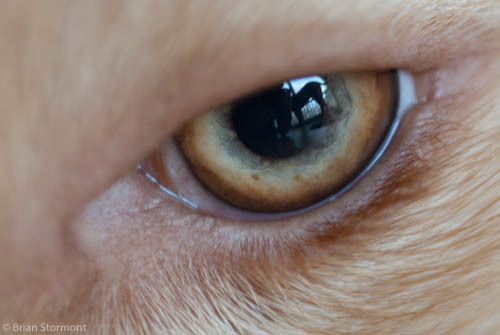 Coincidentally, you can also see my other dog Bodhi reflected in his pupil.